When a mortgage qualification involves co-borrowers, lenders use the lowest credit score among them to determine the rate, Mr. Walsh says. The threshold for the best jumbo-mortgage rates usually is a score of 740, but some lenders may want 760 or higher, he adds. If both spouses’ scores are lower than 740, the math can still work in favor of a single borrower, Mr. Walsh says. And even if the difference in credit scores is slim—one spouse has 700, the other 699—that one point can make a difference in the loan’s interest rate, Mr. Walsh says. However, some couples will need both incomes to qualify, especially for jumbo mortgages, which have bigger balances than government-backed loan limits of $417,000 in most places and $625,500 in some high-price areas, he adds. A second reason some spouses stay off the mortgage is to keep their finances separate, says Mathew Carson, a mortgage broker with San Francisco-based First Capital Group. In some cases, they may just have purchased the property before marriage and don’t want to refinance, but it could also be a strategic decision so that the spouse without the mortgage credit liability can qualify for other big-ticket purchases, he adds. A third reason for borrowing alone occurs most often with jumbo mortgages, where borrowers are more likely to be self-employed and/or have other more complex income breakdowns, including bonuses and commissions, says Bill Banfield, vice president of Quicken Loans. If one spouse has a straightforward job with regular earnings on W2 statements and enough income to qualify, it could reduce stress to not have to assemble all the documentation required to also qualify the self-employed co-borrower, Mr. Banfield says. Before one spouse goes solo on the loan, there are two things to keep in mind. First, a co-borrower doesn’t have to have income to be on the note—as long as the other spouse meets the lender’s income requirements, Mr. Carson says. Co-owning the home and having both names on the note benefits a nonemployed, stay-at-home spouse. The mortgage helps maintain a credit score that could be important later, especially in the unfortunate event of a divorce or death of their spouse, Mr. Banfield says. “If you take yourself off the grid and aren’t on a mortgage or car loan, you may not retain your credit history.” he adds. 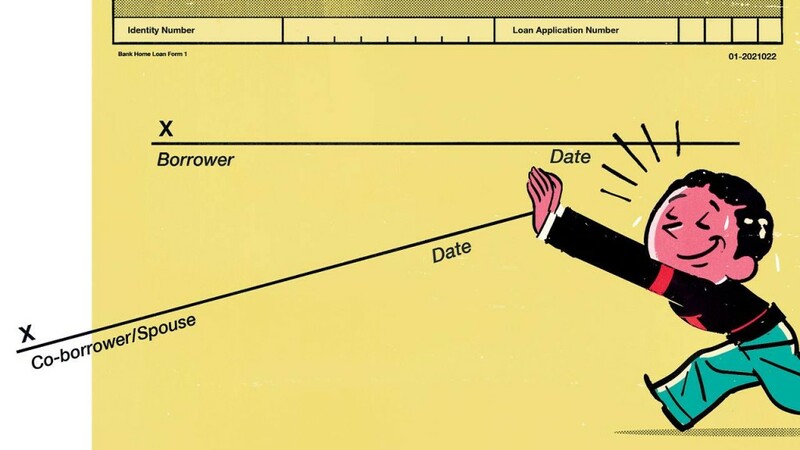 Also, a nonborrower spouse filing a separate tax return can usually take the mortgage-interest deduction for any portion paid by that spouse up to a limit of interest on $550,000 of mortgage indebtedness, says Mary Canning, dean emeritus of Golden Gate University’s School of Taxation and Accounting in San Francisco. The spouse must have “beneficial” or “equitable” ownership by Internal Revenue Service standards, she adds. • Location matters. In community-property states, such as California, lenders may still consider both spouses’ credit scores and/or debts in the qualification process, even if only one borrower is on the loan, Mr. Walsh says. • Asset gift. Even if one spouse isn’t on the loan, he or she can contribute to the down payment by gifting cash or assets to the borrower, Mr. Banfield says. • For sale by both owners. 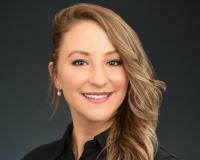 Both spouses also don’t have to be on the mortgage or on the title to receive the full $500,000 capital-gains exclusion on their tax return following a home sale, Ms. Canning says. However, the couple must file a joint return, both must have used the home as their primary residence for at least two of the past five years (living together before marriage also counts), and neither spouse can have used the exclusion on a different home within the past two years, she adds.